Before streaming video services started to grow in popularity, the most common way for people to enjoy a movie at high resolution is with Blu-ray discs. Now that people can easily find 720P, 1080P and even 4K resolution movies on Netflix, iTunes, Vudu and other video streaming service provider, they might start to wonder if it’s still the right thing to do to continue buying Blu-ray discs. If that’s a question you are having, check out the content below and see which one: Blu-ray or digital HD, is better. Blu-ray VS Digital HD: Which one has better video and audio quality? Most Blu-rays are at 720P or 1080P resolutions with some exceptions of 4K discs. With years of development, many streaming service providers had started to offer 720P, 1080P or even 4K as well. Some might take resolution as the basic standard of quality. While resolution does reflect the video quality in a certain degree, there are a lot of other aspects about a video that could affect the quality of a video. Movies provided by these streaming services might have the same resolution as Blu-ray, but in order to be able to make the delivery of the movie on the internet possible, there will be compressions on the movie. The speed limit of the internet dictates the video files being transferred can’t be too large. So the service provides will have to use compression to make the video smaller and easier to be delivered to viewers via the internet. A single-layer Blu-ray disc can hold 25GB of data and a dual-layer disc can hold 50GB. In comparison, a 1080P movie you download from iTunes is mostly around or under 6GB. A compressed video will inevitably have some artifacts like softness or banding that could have negative effects on the image quality. Those are the compromises you will have to make when using streaming services. Also the sound quality of digital HD videos is not as good as Blu-rays. Blu-rays have been utilizing the Dolby TrueHD and DTS HD Master Audio standards for years. 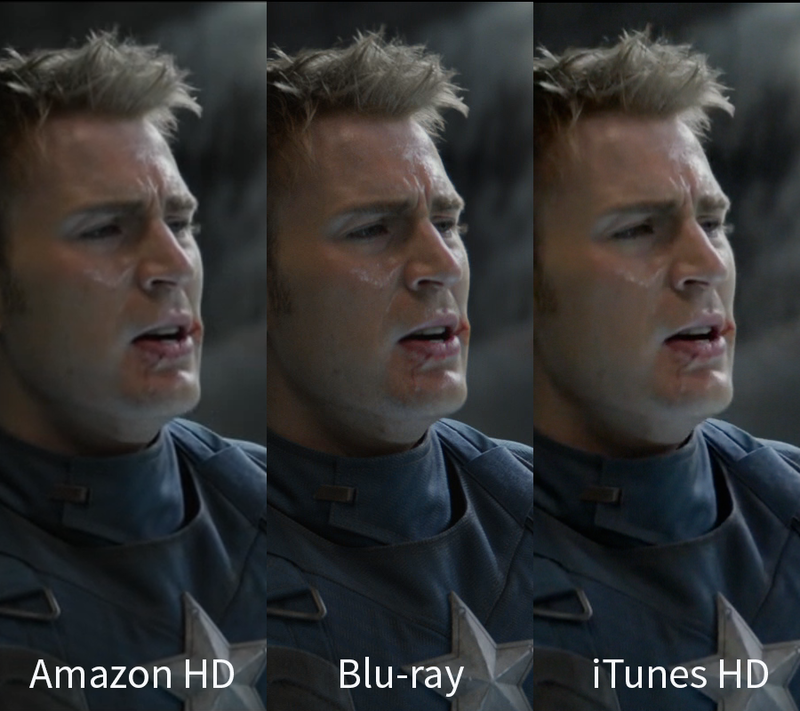 With the said technologies, Blu-rays can deliver spectacular audio effects. And streaming services don’t handle these surround sound technologies well. Due to the overall compression of the file size, there will be way less detail in the movie you stream online than the movie on Blu-ray. Typically Blu-rays will contain extras like commentary tracks, behind-the-scene footages that unveil the filmmaking process. But those contents can’t be found on streaming services unless you look for them yourself. As powerful and promising as the internet appears to be, sometimes it’s really hard for you to find a movie on it. There are certain movies that are not offered by streaming service providers. While Blu-rays and DVDs of the movies can be easily found on video stores, they just appears to be missing on the internet. With a Blu-ray disc, you can watch it anytime you want at home. While streaming services will require subscription, which becomes invalid after it expires. And you won’t be able to access the movie unless you continue to subscribe their services. But the good thing about streaming services is that you can access the movie on your mobile handsets or any other devices with access to the internet at any time, in any location. All in all, both Blu-rays or physical media and streaming services have their own merits, there’s no way to determine which one is better in general. They all have their own advantages over the other in certain aspects. If you want the most immersive, spectacular viewing experience, physical media is still your best option. As is stated previously, physical media delivers the best movie viewing experience. But on computers and mobile devices like iPad, most people would prefer to go with streaming services as it’s easier to access movies that way. Say you are going on a road trip and want to entertain yourself with a movie while on the road when you are not the driver, the best option you have would be streaming services like Netflix on your phone. But you will have to use a significant amount of traffic data to stream a movie without Wi-Fi. Should that happen, I would suggest that you have your movies on Blu-ray converted to a playable format and transfer it to your handsets for playback. There are some excellent programs that can have your Blu-ray movies converted into a high-quality video file. The most ideal result would be a lossless video that gives you the best video and audio quality on your handset and it’s possible to make that happen. There are programs that can convert Blu-rays to lossless MKV videos. There would be no compression used that would compromise the video and audio quality of the movie. The only problem is that a lossless MKV video would be extremely large and could take up all your storage space on your device. But if you are okay with that, then proceed and read the following content to see what programs you can use to convert your Blu-ray movies to a digital video file and how to do it. The first program I’d like to introduce to you for ripping Blu-ray to lossless MKV is Leawo Blu-ray Ripper. It’s a versatile Blu-ray ripping program that can convert all kinds of Blu-ray movies to video and audio files in various formats. With it you can easily create a Blu-ray digital HD video file for viewing on your mobile handsets. And of course, lossless MKV is not your only option, you can also convert Blu-ray to MP4 or other formats so that the movie file wouldn’t be that big and it would allow you to fit more movies in your phone. Below are the instructions for using Leawo Blu-ray Ripper to rip Blu-ray to lossless MKV. Note: Leawo Software had decided to integrate Leawo Blu-ray Ripper with its software suite: Leawo Prof.Media a few years ago. So Leawo Blu-ray Ripper is actually a part of Leawo Prof.Media now. Step 1. Start Leawo Prof.Media and click the Blu-ray Ripper shortcut icon after entering the program’s main interface to have Blu-ray Ripper started up. Step 2. 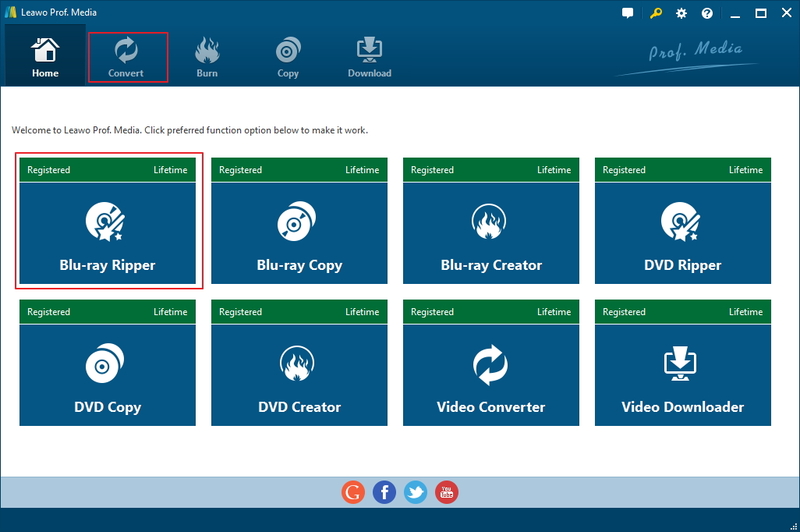 If the Blu-ray disc you want to rip has been inserted to your Blu-ray drive in advance, you can directly click Add Blu-ray/DVD>Add from CD-ROM to load the Blu-ray content to Blu-ray Ripper. If the disc hasn’t been inserted in your Blu-ray drive, just put it in and wait for a few seconds for the program to detect the disc. Step 3. After all the Blu-ray data are loaded to Blu-ray Ripper, the program will show you a list of all the videos in the disc. In this step, you are required to choose which videos to rip and convert. The 3 buttons offers you with 3 different options for picking out the videos you need quickly. Click Full Movie and all the videos in the disc will be ripped and converted when the conversion process starts. Choose Main Movie to directly choose the main movie from the list. You can use Custom Mode to manually pick the video titles you need from the list below the buttons. Double-click on a video on the video list to play the video on the video player window on the right side when you are not sure if you’ve chosen the needed video. Click OK to move the chosen videos to a new video list. Step 4. Click the button above the video list with the text “MP4 Video”. That’s the Format button which shows you what format is current set as default. Click on it and continue to click Change on the following menu to open a new panel which has all the supported output formats on it. 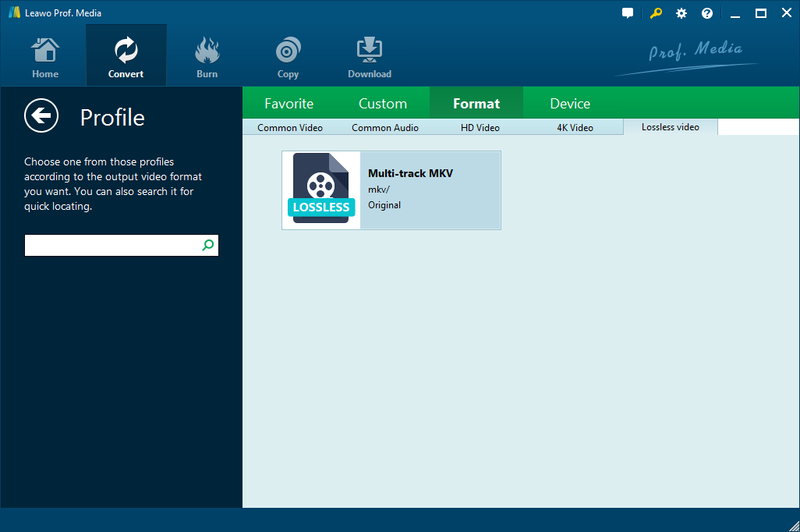 The lossless MKV profile can be found in Format>Lossless Video. There’s only one profile under this section: Multi-track MKV and that’s the lossless MKV profile we are looking for. Directly click on it to choose it and it will get you back to the video list at the same time. Step 5. Click the Convert button in green next to the format button to display a new panel. On top of it is the default output directory. Reset it by clicking the “…” button if you want. And then you may start converting Blu-ray to lossless MKV by clicking the Convert button at the bottom. The lossless MKV video can make sure you get the best viewing experience. But it will require your smartphone to be powerful enough to process all those data and play the movie. If you want, there are always other formats you can convert the Blu-ray movie into with Leawo Blu-ray Ripper. There will be compressions but the quality loss will be kept at an unnoticeable level. If you have faith in your device’s processing power, then you can go for the lossless MKV video. When it comes to ripping Blu-rays to lossless MKV, MakeMKV makes a competitive option. It can also rip protected Blu-rays to lossless MKV. But there’s no other output formats provided so lossless MKV is your only option for output format. But it does offer you with a one-month free trial period which allows you to rip Blu-ray for free. Afterwards, you will have to pay for it in order to continue using it. Here’s how to rip Blu-ray to lossless MKV with the program. Step 1. Enter the source Blu-ray disc in your Blu-ray drive and have MakeMKV started up. Step 2. 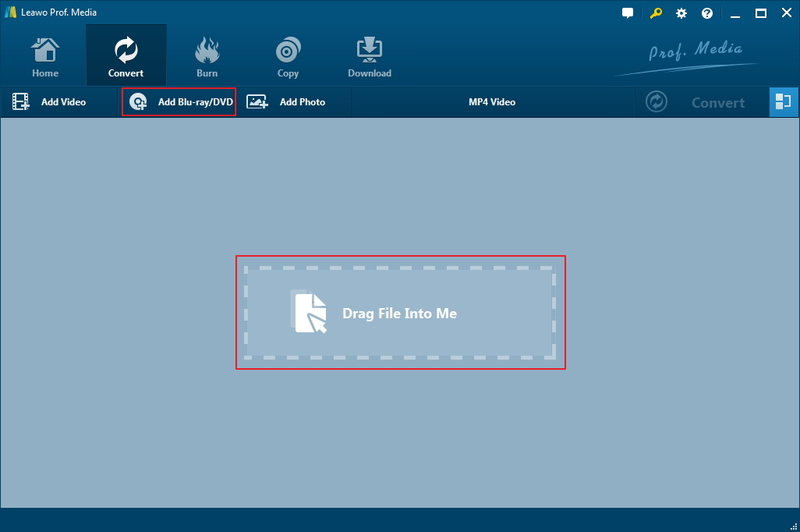 Click the Blu-ray drive icon on the interface to read and load Blu-ray data to MakeMKV. Step 3. Click the title on top of the left column to expand the content list and check the videos, audio tracks and subtitles you need. Step 4. Set the location of the output lossless MKV video in the Output Folder box. Step 5. Start converting the source Blu-ray movie to lossless MKV by clicking the MakeMKV button in the upper-right. When it comes to the comparison of Blu-ray vs Digital HD, there’s no right answer as to which one is better. If to you, quality takes precedence over all other things, then you should probably stick to Blu-ray. But digital HD streaming services are undeniably more convenient for modern day entertainment.